A top division wrestler will arrive at the stadium in the afternoon and enter the changing room. There are ‘East’ and ‘West’ rooms so competing wrestlers do not meet their opponents of the day before the match. 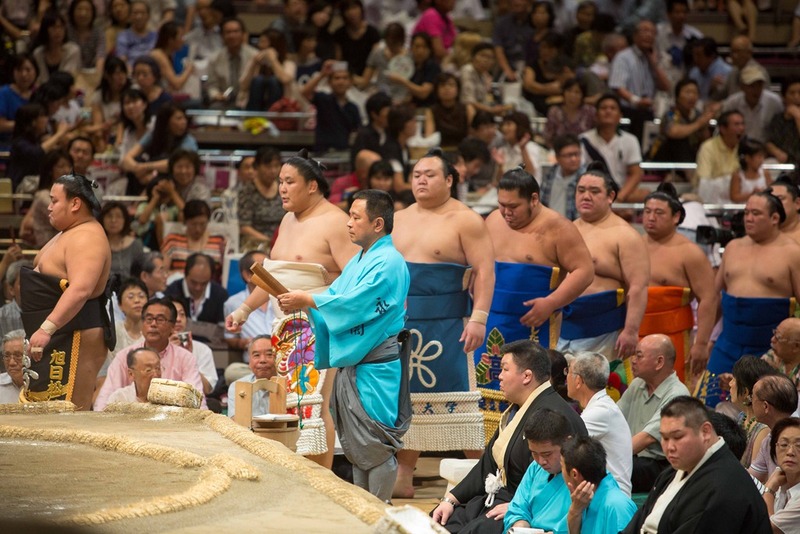 The wrestler will change first into his keshō-mawashi, an ornate, embroidered silk ‘apron’, which he will wear during the ring entering ceremony, or dohyō-iri. 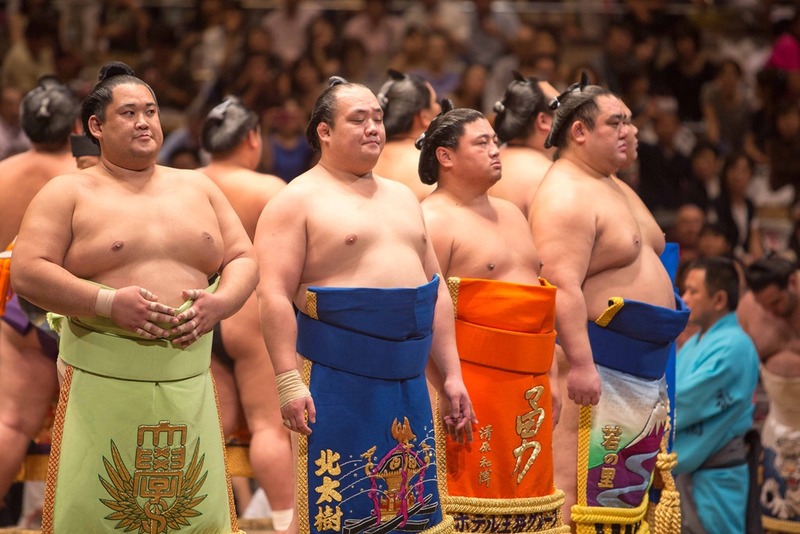 There are four dohyō-iri on each day, two for jūryō and two for makuuchi division wrestlers. In each case there is a procession of those in the east changing room and one for those in the west. During the ceremony the wrestlers are introduced to the crowd one-by-one in ascending rank order and form a circle around the ring facing outwards. Once the highest ranked wrestler is introduced they turn inwards and perform a brief ritual before filing off and returning to their changing rooms. Yokozuna have a separate, more elaborate dohyō-iri; see yokozuna. Their ornate keshō-mawashi, cost between 400,000-500,000 JPN ($6K+). A surprising number of gaijin were wrestling. Once in the changing room the wrestlers change into their fighting mawashi and await their bouts. The wrestlers reenter the arena two bouts before their own and sit down at the side of the ring. 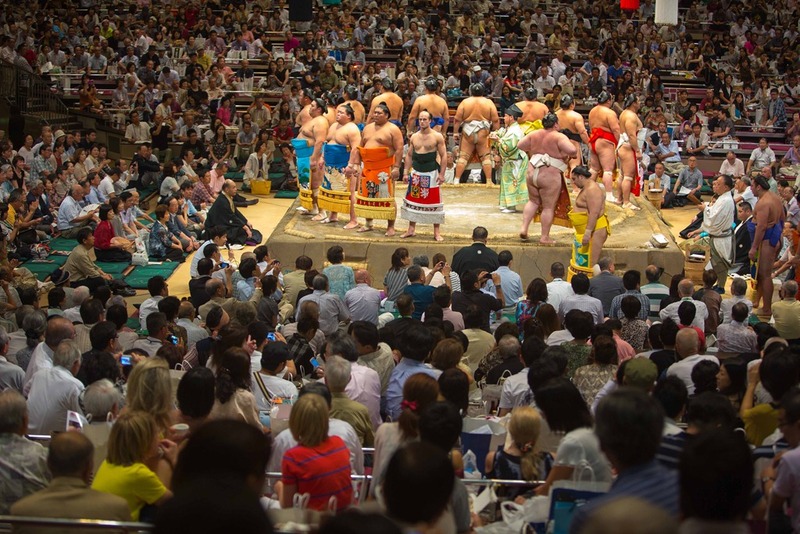 There are no weight divisions in sumo, and considering the range of body weights in sumo, an individual wrestler can sometimes face an opponent twice his own weight. 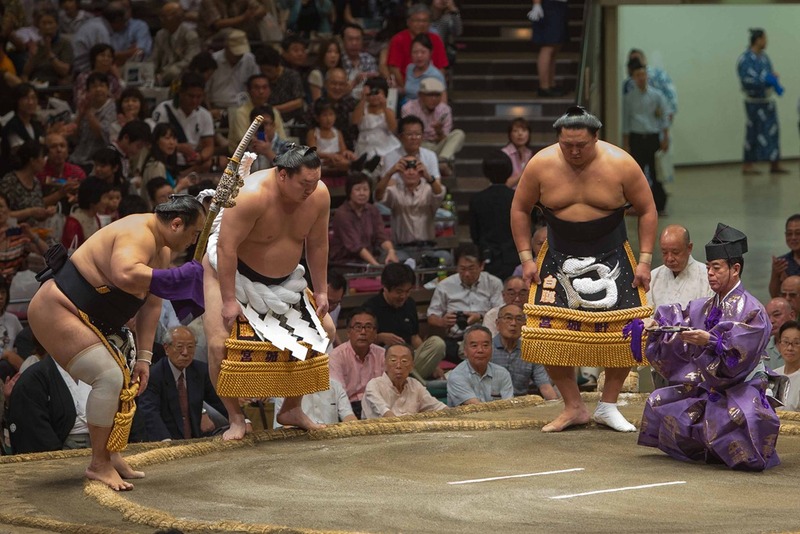 When it is their turn they will be called into the ring by a yobidashi (announcer) and they will mount the dohyō. 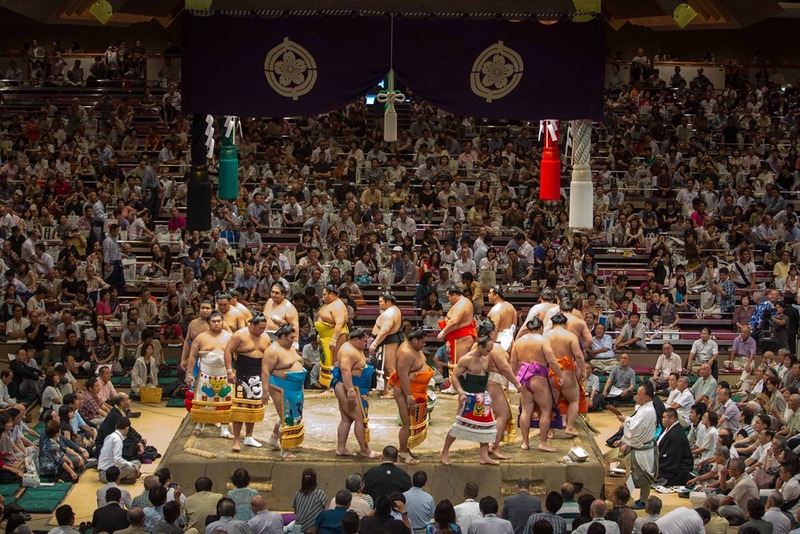 T he leading roles in the dohyo-iri are reserved for the yokozunawho have not taken any part in the ceremony up to now. Ayokozuna comes down the aisle attended by a senior gyoji and two maku-uchi rikishi in kesho-mawashi one bearing a sword. 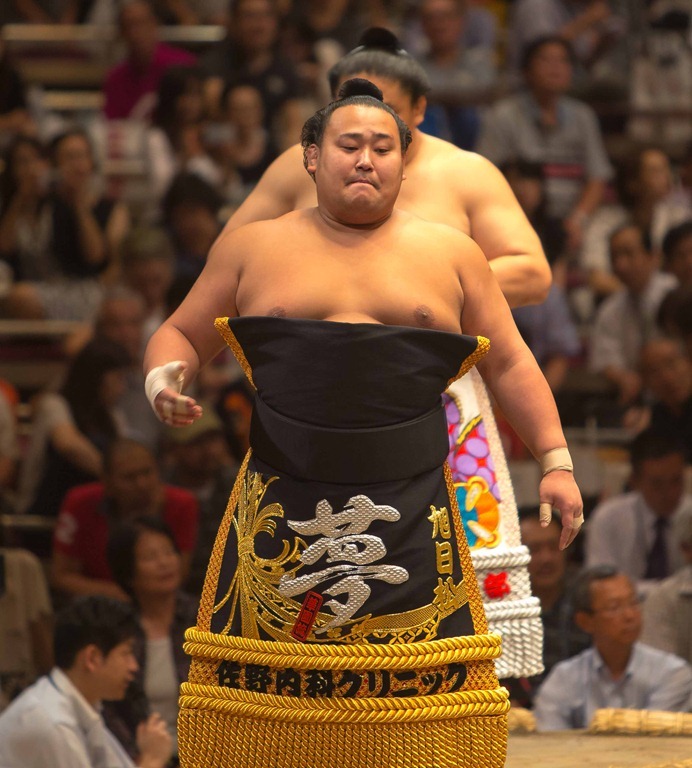 Over his kesho-mawashi theyokozuna wears a massive braided hemp rope weighing from 25 to 35 pounds tied in a bow at the back and ornamented in the front with strips of paper hanging in zigzag patterns. This is a familiar religious symbol in Japan. It can be found hanging in Shinto shrines and in the home over the “shelf” of the gods where offering are made at New Year. Once completed, the final matches began. 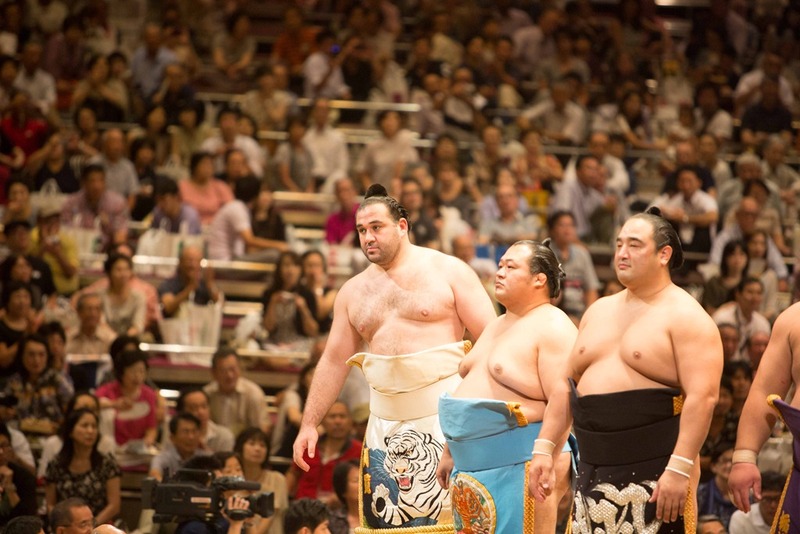 This entry was posted in Our Asia Adventure and tagged Japan, opening ceremony, Sumo, Tokyo by michaelweening. Bookmark the permalink.